Easy Adjustable Closure for a Perfect Fit! Soft terry cloth insole and cushioned cotton/foam upper. TPR rubber outsole for long lasting indoor/outdoor wear. Machine wash. Imported. Specify Women's size & width: MD(6 1/2 - 7 1/2), LG(8 - 9), XL(9 1/2 -10 1/2) or 2X(11-12 1/2) in Medium and Wide width. 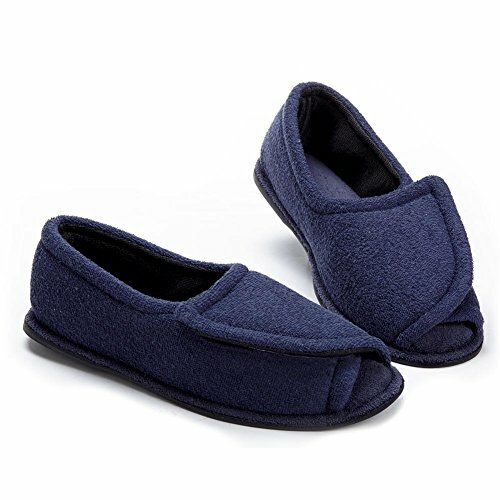 They make perfect house shoes for any with swollen or wide feet. Available in sizes Medium (6 1/2 - 7 1/2), Large (8 - 9), X-Large (9 1/2 -10 1/2) or 2X-Large (11-12 1/2). If you have any questions about this product by Clinic, contact us by completing and submitting the form below. If you are looking for a specif part number, please include it with your message.